A silhouette of a black hand on a blue background exhibits a variety of words associated with computer and network security. 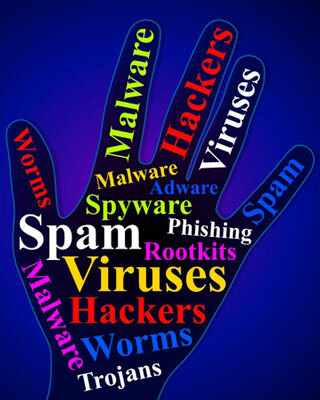 These words — such as viruses, spam, hackers, malware, Trojans, worms, phishing, spyware, and adware — can inspire annoyance and fear in most any computer user. Many organizations and individuals go to great lengths to protect their computers, and the information stored thereon, from viruses and other security threats. Computers that have been hacked or infected by viruses can result in widespread negative effects for the owner of the computer. Identity theft, security breaches, and loss of proprietary information are some of the reasons why your computer must be protected. Use the search box on this page to find information about computer viruses and antivirus software.